I've made it no secret that coffee plays a large part in my life and, as much as I try to limit the amount that I consume in a day... I'd pretty much like a cup morning, noon and night. Would it be too much if I started pouring it into my bowl of cereal? Making my own coffee-based salad dressing? Coffee-butter sandwich, perhaps? Okay, yes, too much. However, just because those ideas sound slightly unappealing, that doesn't mean that the only way to incorporate coffee into my life is by drinking it out of my mug. In fact, the more that I've browsed recipes in books and online, the more that I've come across mentions of using coffee as a baking ingredient, resulting in a thicker, fudge-like consistency to chocolate. Chocolate + coffee = my dreams. Therefore, inspired by a recipe that I found over at Delish, I couldn't wait to brew up a cup of my favorite coffee from Cross Country Cafe and get to work baking it into something delectable. Stir together flour, sugar, cocoa, baking powder, and salt in a large bowl. Combine milk, egg, oil, and vanilla in a glass measuring cup. Make a well in center of the dry ingredients and gradually pour in the milk mixture, stirring until combined. Stir in chocolate chips. Spoon into the prepared pan and spread evenly. Dissolve brown sugar in coffee; spoon over batter (don't be concerned if the pan looks like it has far too much liquid, much of it will be absorbed and the rest will turn into the pudding). Bake until a toothpick inserted in center comes out clean, about 25 minutes. Let stand for 10 minutes; serve hot or warm. 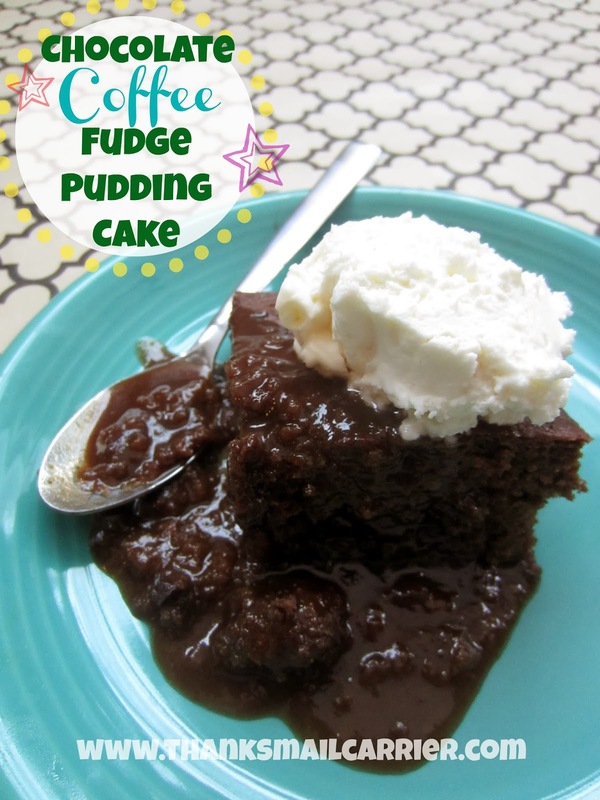 The aroma of coffee and chocolate filled the air as soon as this cake was out of the oven and, with a large dollop of whip cream, ice cream or frozen yogurt, this is an absolutely delicious dessert. Or, for a coffee-lover like me, breakfast. Win-win! Have you ever tried baking with coffee as an ingredient? Oooh That looks really yummy! I love chocolate and coffee together. 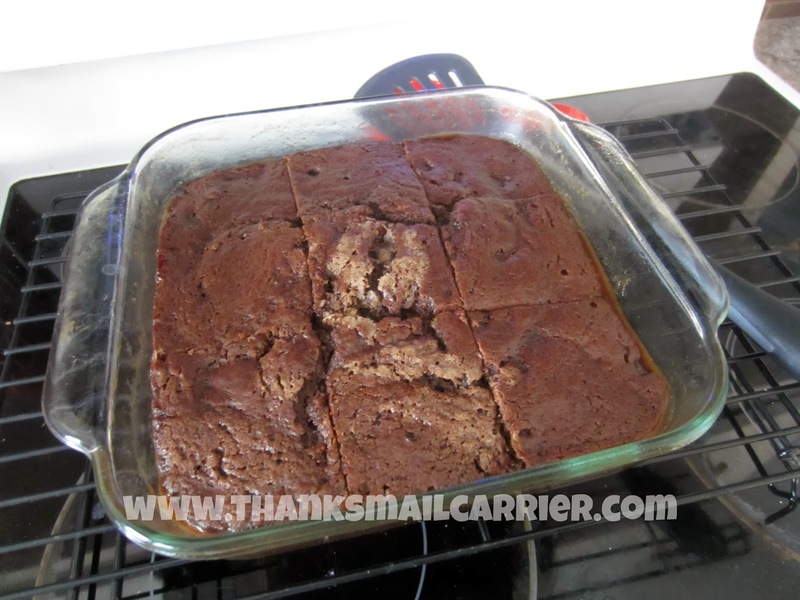 I have made Espresso Chocolate Brownies before. They were really good. I would love to give this recipe a try. Thank you for sharing! YUM!!! What a wonderful recipe, it looks absolutely delicious. Can you actually taste the coffee? Thank you for sharing this recipe. Oh my, if I had a fork in my hand right now I'd stick it through the computer screen. Seriously, this cake is on my try-soon list. Thank you! This looks like a delicious flavor combination! I'll have to try this recipe soon! That looks really tasty and gooey. Thanks for sharing the recipe! I love using coffee in baking! It really gives chocolate a deeper, richer flavor. Especially if you use espresso. Drool., I love coffee anything especially coffee ice cream with chocolate brownies, but the brownies must be warm. This looks so darn good. Merry Christmas mama hope you have a wonderful holiday! This cake looks delicious! I love anything chocolate-related! That looks hard to make. But it looks delicious. I could be nice and make this for my coffee-guzzling friends. Good to take to a pot luck. I love cliffs and I love chocolate. This looks delicious. I would eat this and enjoy it with a cup of coffee. I'm chuckling at these posts as now I don't feel so cray that this recipe has me going gaga!!! I love chocolate and adore coffee, it didn't occur to me to put them together like this - wow! and so healthy - not laden with butter, etc. I hope I can get home without causing an accident as I'm in a hurry to try this! Oh snap that looks crazy delicious. Pinning for later. Thank you for posting this! Looks decadent and not too difficult to make. Yummy. Yummo! Chocolate is my weakness!